11 days after we attached her transmitter, Kailani returned to nest again. For those that have been following along, we attached Kailani’s transmitter in March. The goal of this project is to help us better determine how many times an individual turtle nests within a single season. 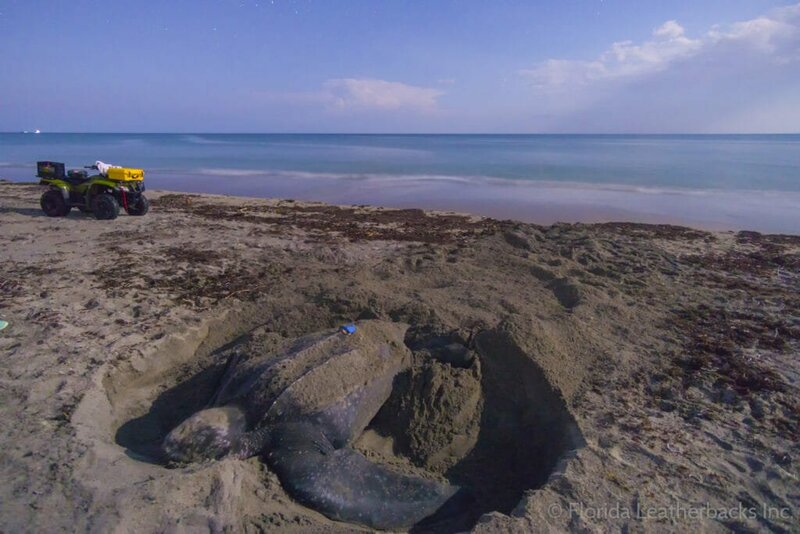 Last season we documented 11 nests from a turtle named Isla! We need to continue tracking turtles to get a better understanding of this number since it’s one way to predict total population size. Leatherbacks nest over a very wide range. They can nest on our survey area one night and 50-100 miles away in ten days. They are not very site specific so transmitters allow us to document each nesting event. They nest every 9-11 days so we’ll be tracking her a lot throughout the season. Our biologists used locations from Kailani’s transmitter to determine that she was off northern Palm Beach County. From our vehicle, we listened to the “pings” from her transmitter that told us when she was at the surface. These pings can only be heard from a couple miles away so that’s why we need to use her transmitted locations to get us close to where she is. When the pinger continuously sends a signal, we know that she is likely on the beach. The antenna that we used is directional so we moved back and forth until we located the exact spot where she emerged. 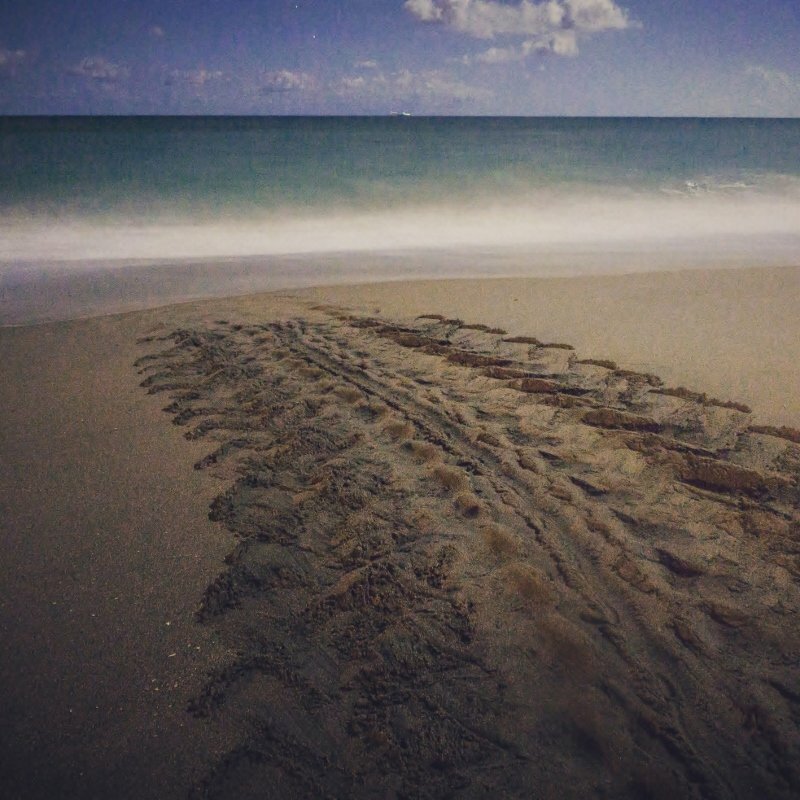 Kailani was found on Juno Beach right in front of The Barclay condominium. We know there are some residents there that are very excited for leatherback updates so we’re happy to let them know that she nested right in front of their building! We’ve had a few turtles over the last several days, including some exciting girls! Nerita, the biggest leatherback ever documented by our team, returned this year! She measured a whopping 177cm long and 125cm wide. That’s a shell length of nearly 6′ not including head and flippers. That’s well over our average of 153cm. Libra also returned to see us! Libra has been nesting in this area since 2002. It’s great to see one of the girls from the original tagging years come back! We’re hoping that things continue to pick up as we head into mid-April. Kailani should be back in four to six days.